Fight Club. Fox 2000 pictures 1999. I don’t know how much room this movie has to surprise me, since I know the surprise twist. It’s one of the unavoidable spoilers of our culture. In fact, for all I know about it, I may be lacking for writing material. I’m looking forward to seeing if the story manages to support the twist better than The Sixth Sense did, as well as just seeing how the story actually plays out. I know where it starts and where it ends, but the transit between is a mystery. To get cliche, the journey is more of the destination than usual this week. Also something about soap. I have no idea what the soap is all about. Edward Norton plays a man who struggled with insomnia until discovering the release of support group tourism, until another “tourist” Marla, started coming to the same groups as him, making him too self-conscious of his lies and nullifying the effect. One day returning from a business trip, he finds himself sitting next to Tyler Durden, soap seller among other things. His condo explodes, and Tyler is the only person he knows whom he can stay with. Tyler has a nihilistic, anti-consumeristic worldview, and a little bit of recreational fighting between them as an expression of manliness or something quickly turns into a nationwide underground bare-knuckle boxing club, through which Tyler spreads this philosophy. Slowly, imperceptibly at first, Tyler starts getting the Fight Club members to spread anti-consumerist mayhem, and then building an army. Fight Club operations quickly grow out of control, and something sinister seems to be on the horizon. There are elements of this story that I don’t even know how someone comes up with. The narration is sparklingly written and delivered. The first ten minutes wowed me with visuals I’m surprised to think are eleven years old. Playing with the fourth wall very, very lightly allows for a huge impact. Despite the running narrative, it is very rare that a character addresses the camera, and it provides at least a palate refreshment and at most a creepy, out-of-the-story’s-world sense. The thing I’m left wondering is what exactly the message of the story is. 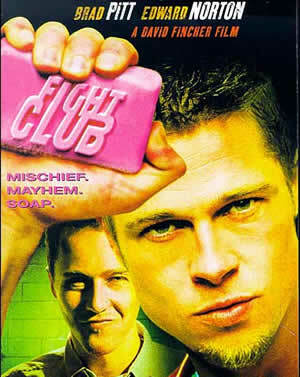 It seems to be a vehicle for Tyler Durden’s ideology, but he takes it villainously far. It seems to paradoxically say that consumerism is bad, but so is fighting the system. If the moral is that we need to wake up and push on the walls within, why doesn’t it spend more time showing that? Durden goes out and makes random people pursue their dreams at gunpoint, and that’s the closest the story gets to the real life application. The story is arresting, and although the visuals are not as flashy after the first few minutes, it’s clear this film was entirely thought out from beginning to end (except possibly for the moral, but it’s probably something I’m not getting). I wish I had the experience of seeing it without having the twist in mind the entire time. Watch this movie: and maybe rethink your perfect furniture. Don’t watch this movie: and join a terrorist cult in response.